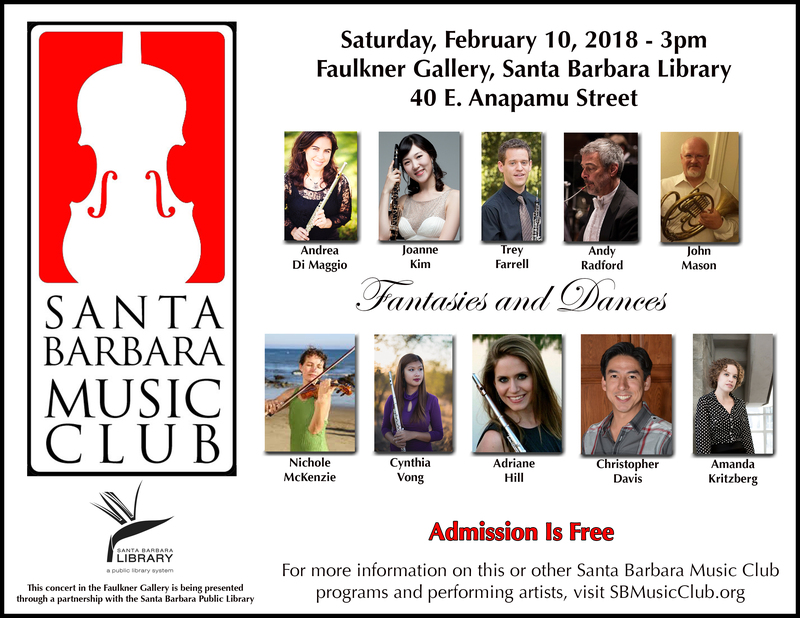 On SATURDAY, FEBRUARY 10 AT 3 PM, the Santa Barbara Music Club will present another program in its popular series of concerts of beautiful Classical music. The concert is presented in partnership with the Santa Barbara Public Library and will be held at the Faulkner Gallery of the Santa Barbara Public Library, 40 E. Anapamu Street. Admission is free. One of the highlights of Santa Barbara Music Club's concerts is the opportunity for audiences to hear great music from a variety of historical periods, with a diversity of musical forms, performed by excellent artists. This concert features works for woodwinds, strings and piano by Samuel Barber, Paul Valjean, Ellen Taffe Zwilich, Ian Clarke, Camille Saint-Saëns, and Albert Franz Doppler. Sonos5winds, a woodwind quintet composed of Andrea DiMaggio, flute, Joanne Kim, clarinet, Trey Farrell, oboe, Andy Radford, bassoon, and John Mason, horn, will perform Samuel Barber’s Summer Music, Op. 31 (1956) and Paul Valjean’s Dance Suite for Woodwind Quintet (1955). Summer Music was commissioned by the Chamber Music Society of Detroit for the principals of the Detroit Symphony Orchestra, who gave its premiere in 1956. In writing a work intended to evoke relaxed summer days, Barber (1910-1981) structured it as a single movement with sections contrasting in mood, character, and tempo. The Dance Suite was written when Paul Valjean (1935-1992) was a student at the Eastman School of Music, studying bassoon with K. David Van Hoesen. He went on to a career as a dancer and choreographer. This composition—possibly his only work— became and has remained very popular with woodwind players. Next, flutists Cynthia Vong and Adriane Hill and pianist Christopher Davis will perform Ian Clarke’s dreamy and lyrical maya (2000). According to Clarke (b. 1964), the title ‘maya’ refers to the meaning ‘illusion’ rather than the South American civilization. The work is based on Passage (1986), by Ian Clarke, David Hicks, and Simon Painter, and was rewritten and arranged by Clarke in 2000. Adriane Hill and Christopher Davis will be joined by clarinetist Amanda Kritzberg for Camille Saint-Saëns’ Tarantella, Op. 6 (1857). Saint-Saëns (1835-1921) was a French composer, organist, conductor and pianist. Written when he was only 22 years old, this Tarantella is a charming and tuneful rendering of the southern Italian folk dance. The program concludes with Albert Franz Doppler’s Fantaisie pastorale hongroise. Op. 26 (1870), performed by Adriane Hill and Christopher Davis. Doppler (1821-1883) was an Austrian composer and flutist born in Poland. The Fantaisie pastorale hongroise, a beautiful and challenging work for flute and piano, uses the slow-fast verbunkos form that Liszt employed in his Hungarian Rhapsodies. Aiding and encouraging musical education by the disbursement of scholarships to talented local music students. 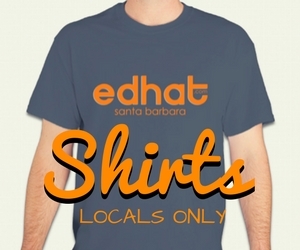 For information on this or other Santa Barbara Music Club programs and performing artists, visit SBMusicClub.org.